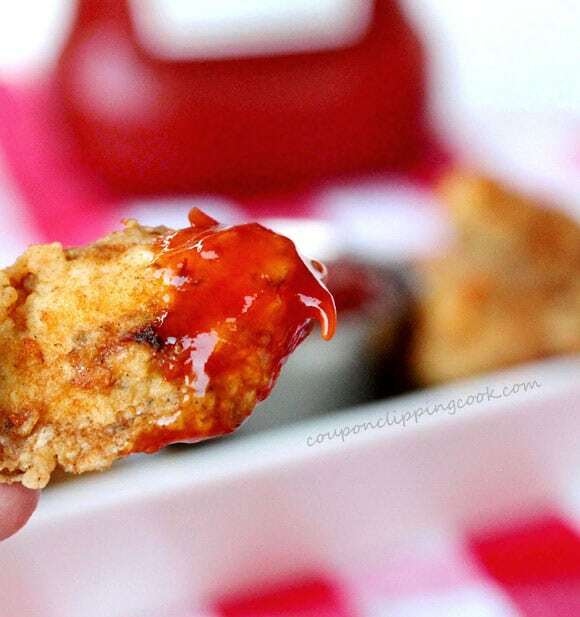 Finger food comfort food to the max. 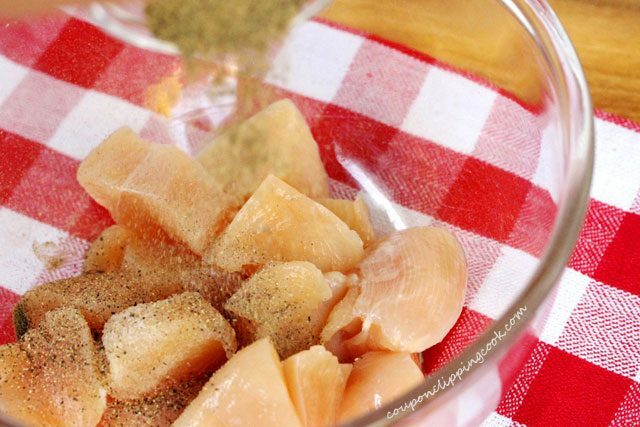 Having boneless skinless chicken breasts on hand comes in so handy for making quick and scrumptious dinners. I like to buy the big bags of frozen chicken breasts where each piece of chicken is packaged separately. Otherwise, if I buy the bags that don’t have the chicken wrapped separately, I seem to always pick the one bag where the pieces of frozen chicken are stuck together. 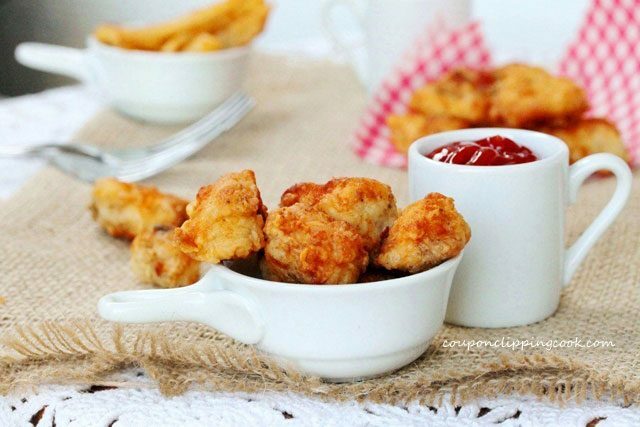 This chicken nugget recipe can be whipped up in no time because all you need are 5 ingredients and that’s counting the salt and pepper. 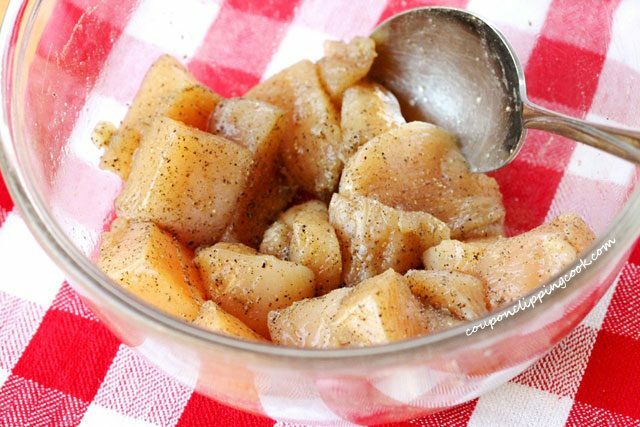 If you happen to have some potatoes on hand they go great with mashed potatoes too. 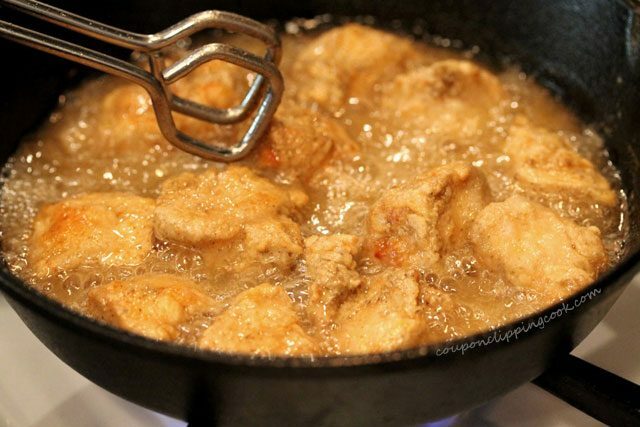 And if you really want to go crazy you can make gravy out of the fried chicken crunchies that get left in the skillet. 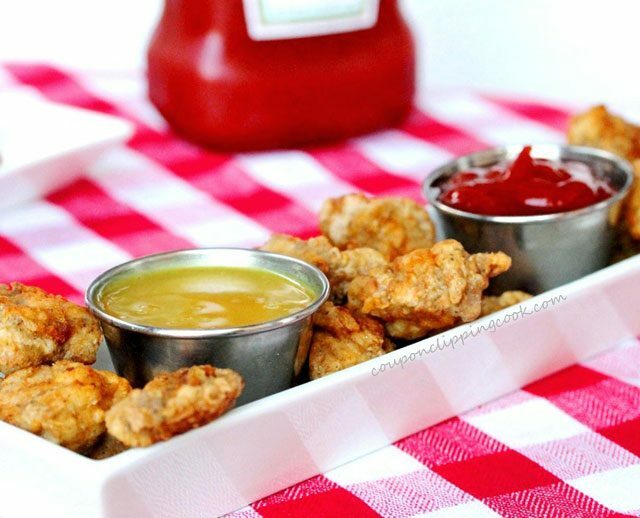 In this recipe “Fried Chicken Sliders with Gravy” there are step-by-step pictures on how to make gravy from fried chicken drippings. 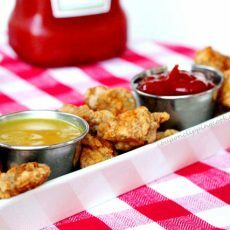 These nuggets are delicious dipped in barbecue sauce, ranch dressing, honey mustard sauce (honey and yellow or Dijon mustard mixed together; add honey until it reaches the desired sweetness), or even ketchup. I like to cut them in square shapes but you can also cut them in strips if you prefer. 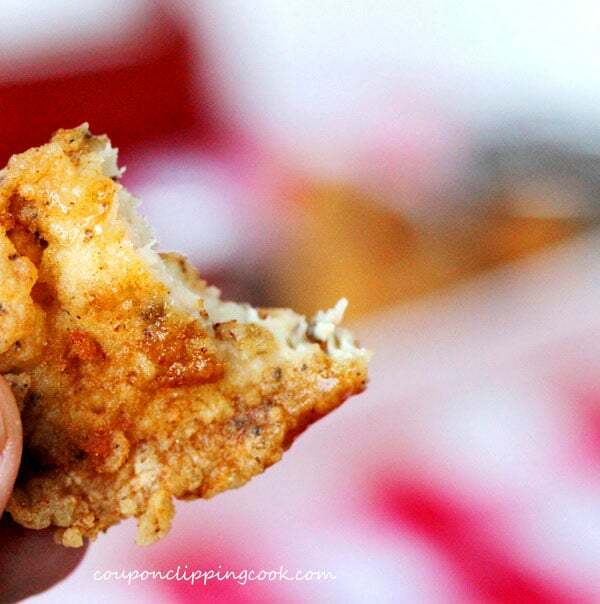 Fried chicken smells so good in the house when it’s cooking…just like comfort food. 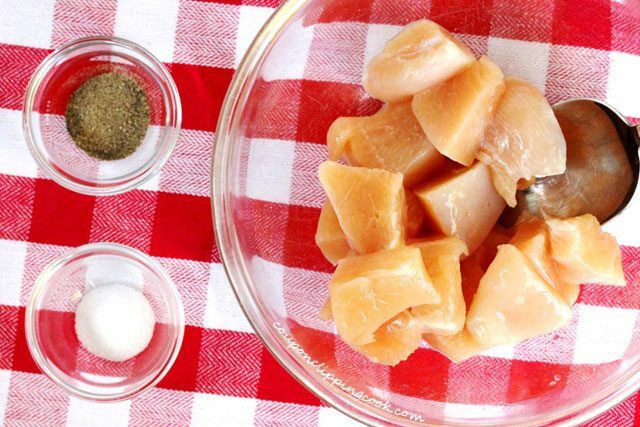 Cut the chicken into bite size pieces and add to a medium size bowl. Then mix together so that the chicken is coated with the salt and pepper. 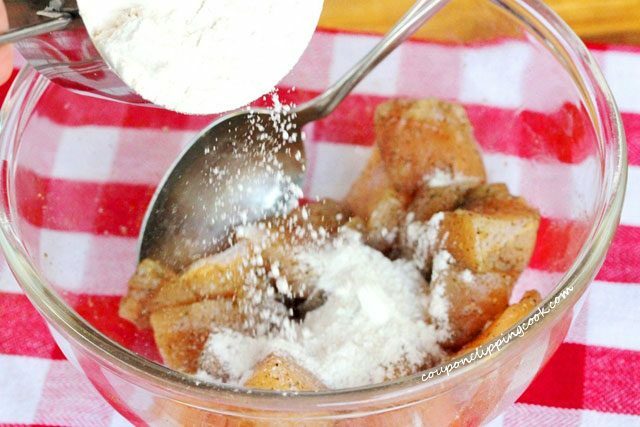 To the bowl, add flour. 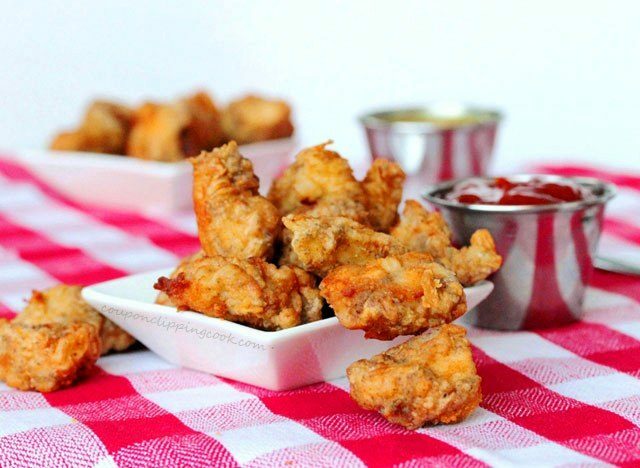 Mix together until each piece of chicken is entirely coated with flour. Set aside for just a moment. Place a cooling rack on top of a large plate (this is where the nuggets will be placed after removing them from the skillet). 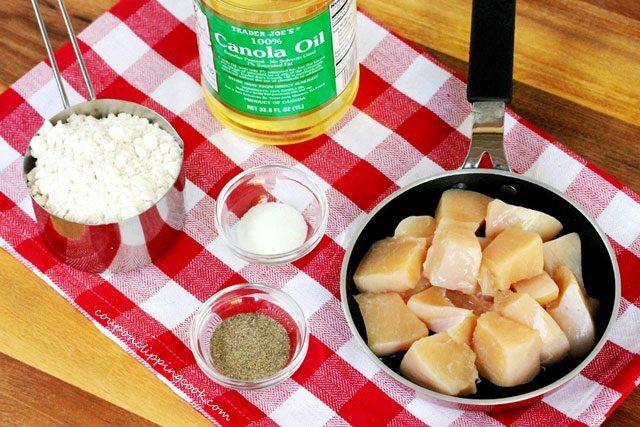 …and add the canola oil (the amount of canola oil needed may vary depending on the size of the skillet used; the oil should be about 1/2 inch deep in the pan). 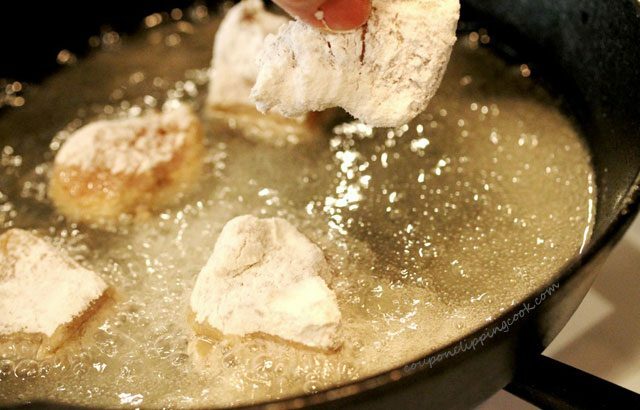 Sprinkle a small bit of flour in the oil, and when it starts to sizzle add the pieces of flour coated chicken to the skillet. Watch the chicken closely and turn each piece over as the sides start to turn a golden color. 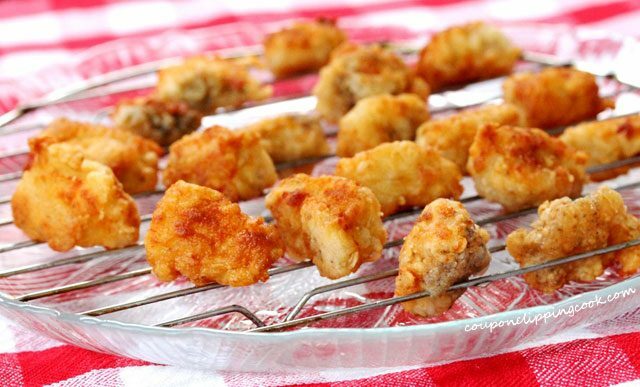 When all sides of the nuggets turn a golden color and the chicken is thoroughly cooked, transfer the chicken on to the cooling rack. …as is with no sauce. 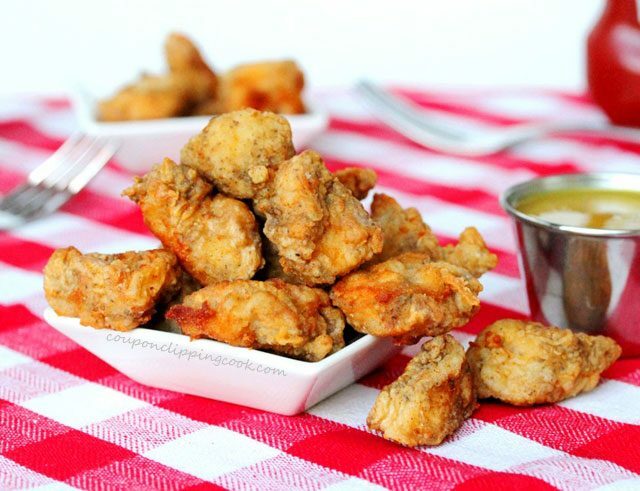 …a quick and easy honey mustard sauce made by mixing either yellow or Dijon mustard with honey (add the honey until getting it to the sweetness you like). These are also super tasty served on top of a salad. To a medium size bowl, add the chicken. Add the salt and pepper and mix together until the chicken is coated. 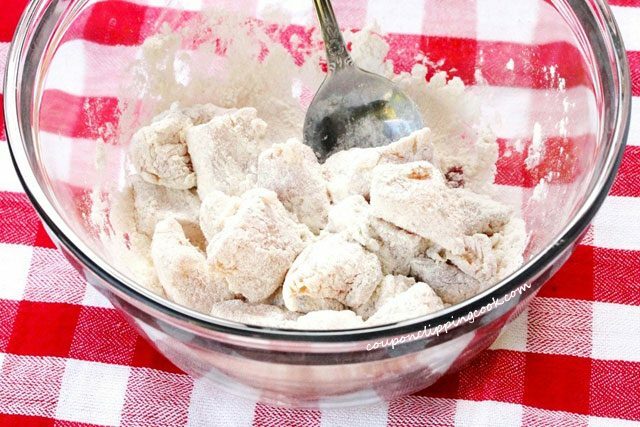 To the bowl, add flour and mix together until the pieces of chicken are completely coated with the flour. Set aside for just a moment. 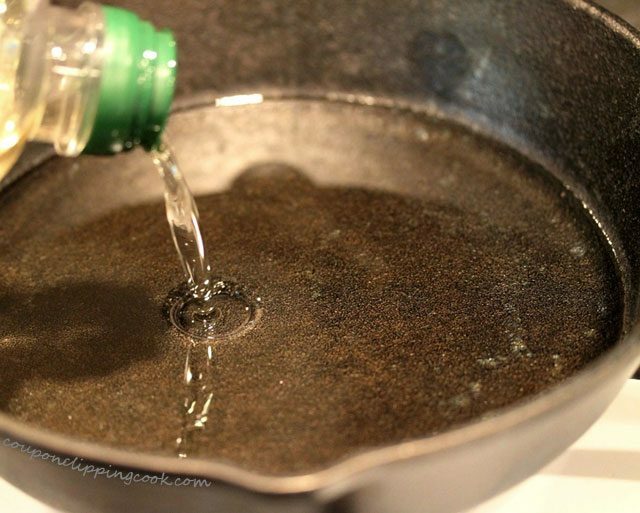 In a large skillet, add canola oil (depending on the size of your skillet you may need to add more oil so that it's about 1/2 inch deep in the pan). 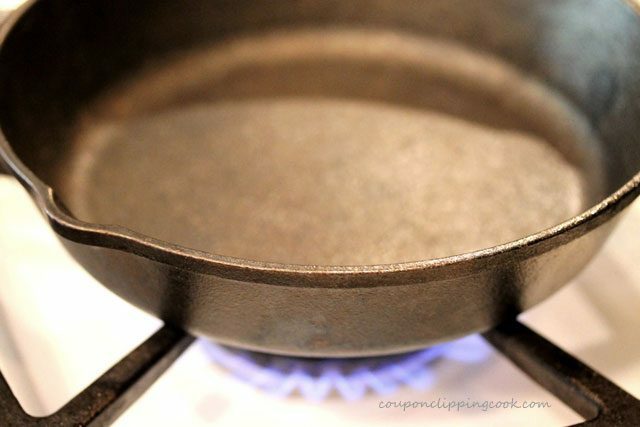 Heat the skillet on medium heat. 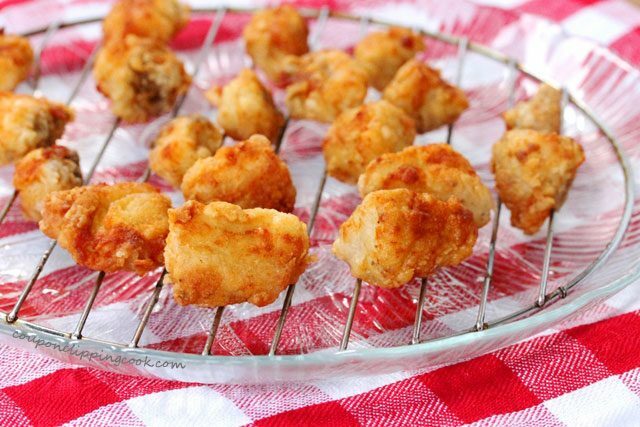 Transfer the chicken from the skillet on to a cooling rack and salt to taste. 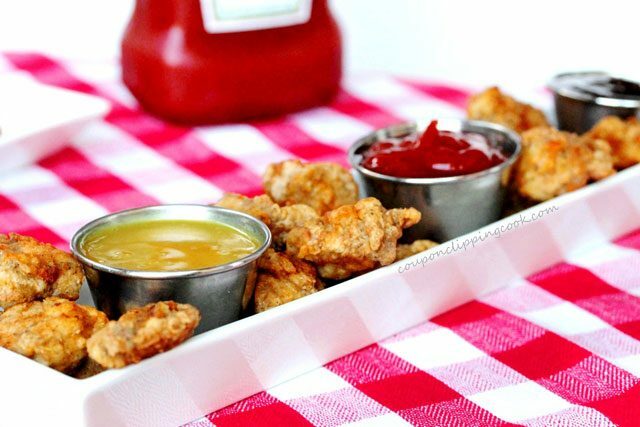 Serve warm with your favorite dipping sauce or gravy. 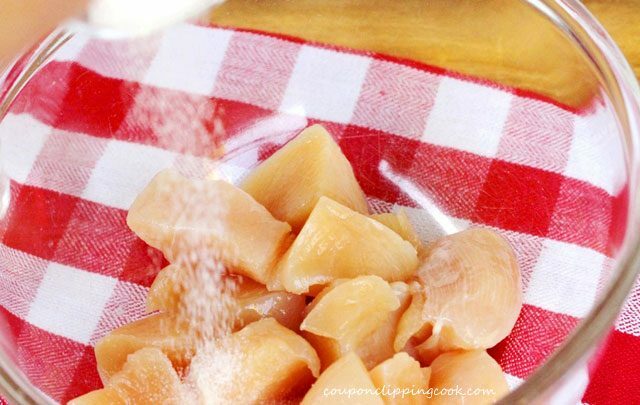 This is simple and delicious recipe, something you can make in a hurry when needed. Hi Mike, it sure is. Seems like I end up making it for dinner when I need to get a meal ready quick. Thank you for stopping by! 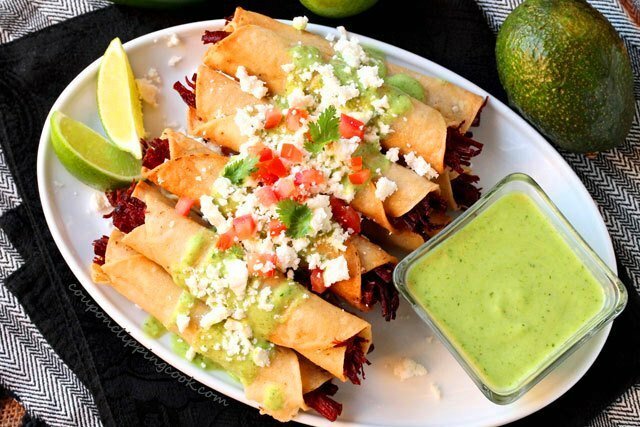 Delicious looking and simple to make. It’s a winning combination! 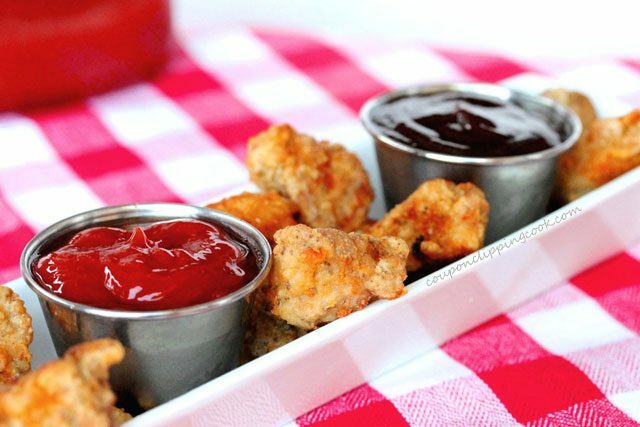 Yummy little chicken bites. These look just perfect.. hungry now. Hi Elizabeth, thank you very much. Have a nice weekend! Hi Taysha, I know what you mean about saving calories. I’m definitely frying things less these days. I haven’t tried baking these but I don’t think the flour coating would do well in the oven without a little oil. But, now I’m curious if using just a little bit of olive oil in a skillet would work when cooking these nuggets. I’m going to give this a try and see how it works out. Have a nice weekend! 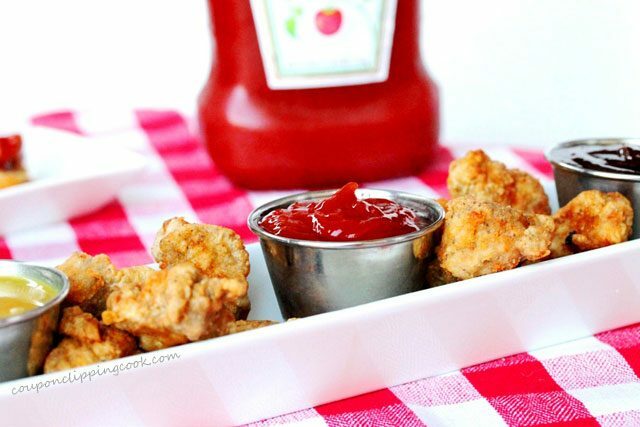 Making chicken nuggets at home is probably cheaper and more healthy than buying some pre-made. 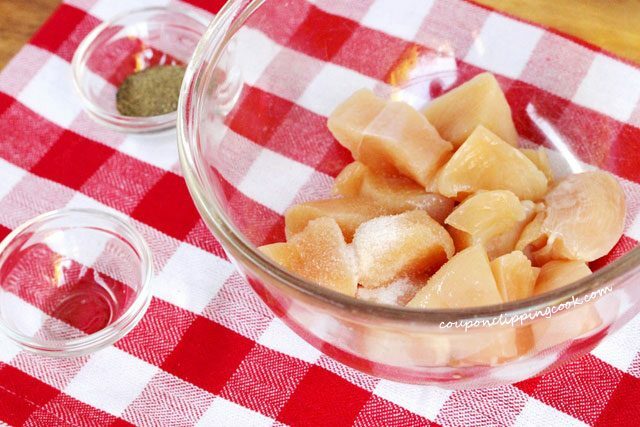 Based on this recipe they are fairly easy to make, so there is no excuse to buy them at the grocers. Yours do look pretty tasty and I can think of many ways to use them, but dipping them would be the first-yum! Enjoy the weekend. Hi Tina, thank you and have a nice weekend!